Cellfood is a proprietary formula produced by NuScience Corporation in an FDA-compliant facility that is GMP certified by the Natural Products Association. 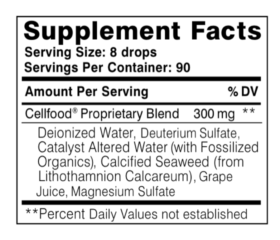 Cellfood contains deuterium sulfate, ionic trace minerals, trace enzymes, and trace amino acids. It provides an unsurpassed oxygen and nutrient delivery system, and is absorbed quickly and efficiently by the body. Cellfood’s unique structure oxygenates and feeds the cells— cleaning and tuning up the body’s systems throughout the day. Cellfood is made from plant substances, and is gluten-free. Adults take eight (8) drops in 8 ounces of purified water or juice, three (3) times per day. May be taken with or without meals. You may mix one day’s amount in a water bottle and sip throughout the day. No refrigeration required. Some may experience a cleansing or detoxification response. If so, decrease dosage at beginning, then gradually resume full dosage. Cellfood has been formulated in a special gel base for external topical use— Cellfood Oxygen Gel. This remarkable gel is made from Cellfood proprietary blend, aloe vera, lavender blossom extract and glycerine. is used and trusted in over ninety countries around the world for over forty-five years.